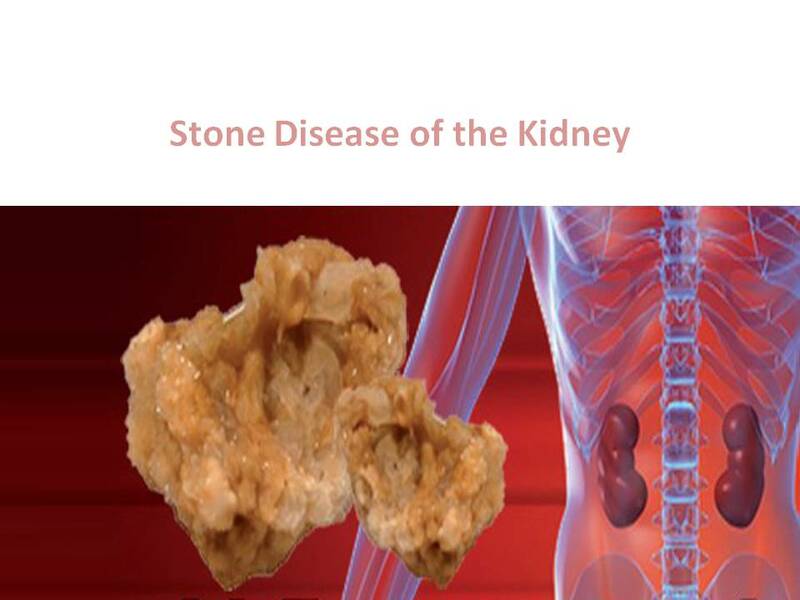 Stone formation in the kidneys is a common disease. About 1 in 8 men and 1 in 20 women suffer from the symptomatic stone disease. Stone formation without symptoms is even more common. About ¾ of the stones contain calcium and 10% have uric acid. Rest are due to combinations and rare diseases. These contain calcium oxalate or calcium phosphate. Former is more common. Low volume, High calcium in urine, High acid concentration and Low citrate levels. Water and fluid intake is low, fruits are seldom eaten, food has high oxalate level or if calcium content of the diet is on the lower side. Other diseases with high risk for stone formation are overweight, gout, diabetes, recurrent urinary tract infection etc. Bariatric surgery is a very significant risk factor. If kidneys have certain diseases like the inability to excrete acid, a stone formation may occur. Symptoms: Stones if they are on the urinary path (ureters or urethra) pain colicky in nature often radiating from back to lower abdomen or upto urine passage opening (urethra) may occur. This pain is at times very severe necessitating urgent consultation. Urine may be passed in drops and is often red in colour due to blood. If the passage of urine is blocked due to stone at any site, high pressure develops upstream of the blockage. If not treated early this may permanently damage the kidney. In India, an untreated stone disease is a common cause of permanent renal failure. Stone analysis, various urine tests aid in finding the underlying cause of stone formation. A cause is found in about ½ of the cases. Stone disease can usually be prevented by adequate water intake, fruits or fruit product ingestion, enough calcium and lower salt in the diet and early complete treatment of urinary tract infection. Eating lower oxalates in the diet is of questionable value. Small stones pass spontaneously with more fluid ingestion and alpha blockers. Large stones need to be removed by surgery.